Dr. Kyana Young, a postdoctoral fellow at Marquette University (MU), began working in the Global Water Center in 2016. With a background in environmental engineering, Young’s passion is finding solutions for safe water to improve global and public health. Soon after she arrived, it occurred to her that there was a lack of diverse groups of people represented in the building. But it didn’t take her long to do something about that. She spoke with staff at Marshall High School and Milwaukee Public Schools (MPS)—including Larry Farris, Toby Hairston, Rochelle Sandrin, Jan Haven and Megan Sun—who helped her come up with an idea for a program that would provide opportunities to demographics that are underrepresented in scientific fields relating to water research. She applied for a grant from MU with the support of the group at MPS and was awarded the university’s Strategic Innovation Fund Grant. 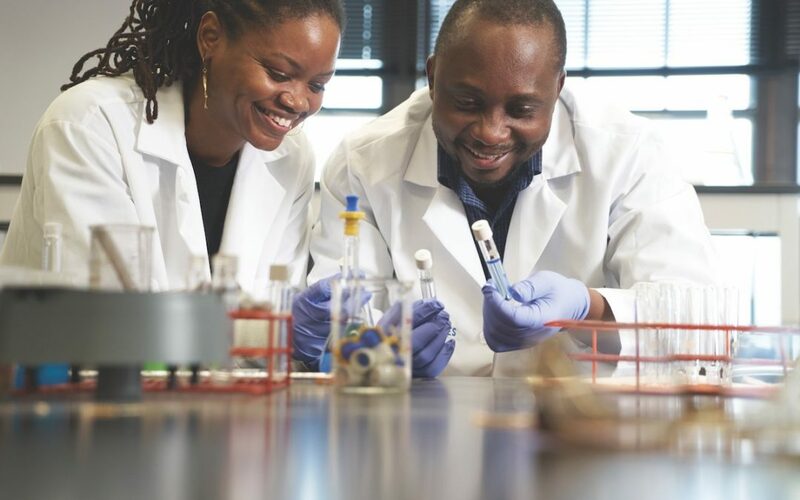 The grant made it possible for her to provide internships to students at Marshall and bring them to the labs of the Global Water Center to do hands-on research. When working in the classroom at the high school, the youth learn how to write lab reports and do data analysis with their teacher, Megan Sun. The students are taught how to apply their newly learned scientific knowledge to solve real world problems. Each student is assigned a project for the semester by participating companies and universities. Young asked these organizations to host and mentor the youth; organizations such as Stonehouse Water Technologies, Youth Rising Up, Solar Water Works, DRM International, Sun Yat Sen University, Grand Valley State University, Assembly of God, as well as MU. Young knew that the students needed more than community partners; they needed mentors like Moe Mukiibi, chief technology officer at Stonehouse Water Technologies (the company with the most interns in the program), to make the program a success. Thanks to Kyana Young, our Hero of the Week, and the team at MPS, these students have a chance to explore their interests and realize career paths that can make a major difference in their lives.